Sir Winston Churchill – Famous People. Did he become a U.S. citizen at birth via “derivative citizenship”? Did he file U.S. income tax returns? The U.S. tax law imposes federal tax on all worldwide income of any U.S. citizen no matter where they reside. 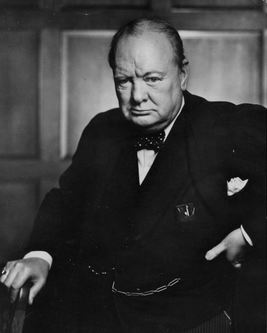 Sir Winston Churchill, was the famous Englishman who was credited with helping defeat the Axis powers in World War II. He became Prime Minister during that War. Sir Winston Churchill’s mother was born Jeannette Jerome in Brooklyn, New York. His mother later became known as Lady Randolph Churchill and would have been a U.S. citizen by virtue of her birth in the United States pursuant to the 14th Amendment (Section 1) of the U.S. Constitution. However, the 14th Amendment was adopted after her date of birth. Every individual, such as Winston Churchill who was born to a parent who was a U.S. citizen must consider whether they too are also a U.S. citizen by the concept known as “derivative citizenship“; i.e., “derived” from a U.S. citizen parent. The U.S. Citizenship and Immigration Services (USCIS) has a “Nationality Chart 1, for Children Born Outside U.S.” to help determine if the individual was a U.S. citizen at birth. Having “derivative citizenship” means the individual became a citizen at birth, even if no (i) Application for Certificate of Citizenship (Form N-600) or (ii) U.S. passport (Form DS-11: Application For A U.S. Passport) is ever applied for by the individual. In addition, Winston Churchill was granted honorary citizenship of the United States during his lifetime. Was he already a U.S. citizen by virtue of his mother? Did he ever file U.S. income tax returns? Did he die owing U.S. income taxes to Uncle Sam? If he was a U.S. citizen, he would have also been subject to U.S. estate taxes on his worldwide estate. Did his executor ever file U.S. estate tax returns when there was only a US$60,000 exemption and a top estate tax rate of 77%? At least, fortunately for Sir Winston Churchill, the law of FBARs was not created until 1970, some 5 years after his death in 1965. See, When does the Statute of Limitations Run Against the U.S. Government Regarding FBAR Filings? The U.S. Civil War is the Origin of U.S. Citizenship Based Taxation on Worldwide Income for Persons Living Outside the U.S. ***Does it still make sense? Children born outside of the US to a citizen mother and a non-citizen father prior to 1934 did not acquire derivative citizenship, either at birth or retroactively.